Textile Auxiliary Chemicals, offered by us, are widely in demand for the excellent performance they give during usage. Textile Auxiliaries that we Manufacture are not harsh on the environment, and therefore prevents land as well as air pollution during usage and production respectively. We are capable of taking up bulk orders of Auxiliaries and make sure to deliver these at competitive rates. machines like soft flows & jet. Gives uniform wetting and penetration of caustic liquor of mercerizing and causticising Strength. Very High Soil Suspending Power. Prevents crack marks, creases, wrinkling & fold marks. Improves the sewability of Woven & Knit Fabrics. Produces a very soft, smooth handle. Spirowash EO 20 Soaping Agent Improves the washing fastness of Reactive dyed cellulosic fabrics. Spirowash EO 40 Concentrated Soaping Agent Improves the washing fastness of Reactive dyed cellulosic fabrics. Spirolev RE Levelling Agent for Reactive dyes Improves the washing fastness of Reactive dyed cellulosic fabrics. Spirofix NFD 150 Concentrated Formaldehyde free Dye fixing Agent. Enforce even rate of absorption which results, excellent penetration and level dyeing. Spirofix NFD 150 Eco Formaldehyde free Dye fixing Agent. Economical Improves the wet Fastness. Does not impair the shade of the dye. Dose not impair fastness to light and chlorine. Spiropret DM 10 Demineralisation Agent An iron chelating Chemical for demineralization of cotton during scouring and bleaching process thereby preventing catalytic damage. 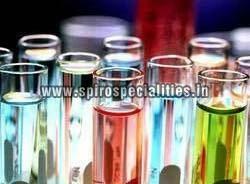 Spiroquest 100 Sequestering Agent Chelates Ca++/Mg++ and other impurities. Spiroclean DP Stain Remover Effectively eliminate greasy stains, oil and water stains. Improves Tear and abrasion resistance. Polyester and on polyester blended. Minimizing Back staing during an enzymatic wash on denim. Suitable for Yarn dyed fabric Washing.